Concrete is chosen for driveways and patios mainly because of its durability and low cost of maintenance. One of the most common stains found on concrete is that of oil and grease, caused mainly due to oil spills and leakages from the car. Although grease stains can be avoided by keeping a pan under the car to catch the dripping oil, you are likely to fret once the concrete stains. Get rid of your worries; follow the steps outlined in one of the methods, and remove grease stains from the concrete easily. Always remember to wear goggles, a mask and rubber gloves when using dangerous chemicals. Otherwise, they can cause damage to you. 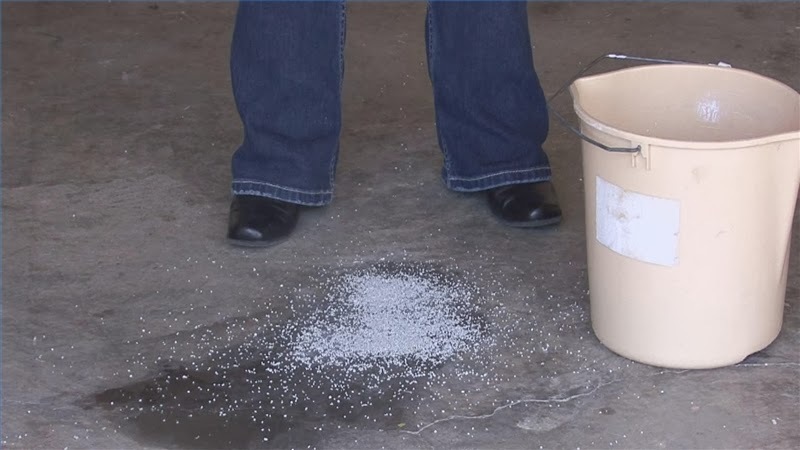 You can adopt any one of the following methods to get rid of grease strains from concrete. 1. To start off with the cleaning process, grab the box of cat litter, and cover completely the grease stain with it. 2. Wear old shoes. You will have to crush the big chunks of cat litter with your shoes. 3. Let the cat litter sit in place for a while. 4. Then, brush away the cat litter with your regular broom. 5. Remember, grease laden cat litter is to be treated as a hazardous chemical. Hence, do not just throw it in your dust bin. Call the local waste management company to find out how to get rid of the cat litter in a proper manner. 6. Next, take a regular or diet coca-cola, whichever is available, and pour it on the grease stained area on concrete. 7. Scrub the coca-cola covered area using a hard bristle brush. 8. Leave the coca-cola in place for 20 minutes. Make sure that it does not dry out during the scrubbing process or during the 20 minutes for which it has been left in place. If the cola stops fizzing a little before the end of 20 minutes, proceed to the next step. 9. Use the garden hose to wash away the coca cola from concrete with water. The grease stain should have faded to a shade of grey by now. 10. Now, grab a bucket, fill it with 1 gallon of very hot water. Add 1 cup liquid chlorine bleach and 1 cup ammonia-free powdered laundry detergent. Using a spatula, mix all the ingredients completely. 11. Grab a soft, clean cloth, dip a part of it in the solution, and apply it to the grey stained area. Be careful as to not dip your hand in the solution. 12. Scrub the affected area with the solution till it the grease stain is completely removed. 13. Once done, rinse the concrete with plain water to remove the solution from its surface. 1. The first step requires you to make the cleaning solution required for the removal of the grease stain from the concrete. To do so, grab a bucket; fill it with 1 gallon of hot water. Add 1 cup of trisodium of phosphate to the water. Mix the two ingredients completely using a spatula. 2. To apply the solution to the stained area, you can pour the solution on it if the grease stain is large. For a small stain, dip a soft, clean cloth in the solution and apply it to the affected area. 3. Leave the solution in place for 15 to 20 minutes. The time will allow the solution to treat the stain, and loosen the grease particles from the surface. 4. Using a stiff brush, start scrubbing the concrete till the entire grease stain has been removed. 5. Once done, wash away the solution from the concrete surface with plain water. Use your garden hose for this purpose. 6. Check for any remaining visible grease stain that still may be present on the surface. If there is any, repeat the above steps. The above solution of phosphate and water is to not be used on asphalt.